Global myasthenia gravis market expected to generate around USD 2,091 million by 2025, at a CAGR of around 10.2% between 2019 and 2025. Myasthenia Gravis is an autoimmune neuromuscular disorder that leads to serious muscle weakness. It is caused due to an error in the transmission of nerve impulses to muscles. The report covers a forecast and an analysis of the myasthenia gravis market on a global and regional level. The study provides historical data for 2016, 2017, and 2018 along with a forecast from 2019 to 2025 based on revenue (USD Million). The study includes drivers and restraints of the myasthenia gravis market along with the impact they have on the demand over the forecast period. Additionally, the report includes the study of opportunities available in the myasthenia gravis market on a global level. In order to give the users of this report a comprehensive view of the myasthenia gravis market, we have included a competitive landscape and an analysis of Porter’s Five Forces model for the market. The study encompasses a market attractiveness analysis, wherein all the segments are benchmarked based on their market size, growth rate, and general attractiveness. The study provides a decisive view of the myasthenia gravis market based on diagnosis, treatment, end-user, and region. All the segments have been analyzed based on present and future trends in the market are estimated from 2019 to 2025. By diagnosis, the market is segmented into edrophonium tests, blood tests, pulmonary function tests, electrodiagnostic, imaging, and others. By treatment, the market is segmented into surgery, medication, plasmapheresis and intravenous immunoglobulin, autologous hematopoietic stem cell transplantation (HSCT), and others. By end-user, the market is segmented into hospitals, academic research institutes, clinics, and others. The regional segment includes the current and forecast demand for North America, Europe, Asia Pacific, Latin America, and the Middle East and Africa with its further divided into major countries including the U.S., Canada, Germany, France, UK, Brazil, China, Japan, India, and Brazil. 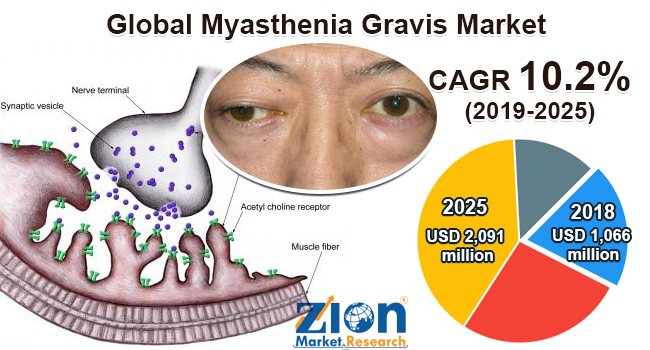 Some key players of the global myasthenia gravis market are Novartis Pharmaceuticals Corporation, AbbVie Inc., Biogen Inc., Pfizer, Valeant Pharmaceuticals International, Bristol-Myers Squibb Company, F. Hoffmann Roche La Ltd., GlaxoSmithKline, RPG Life Sciences, and Grifols SA, among others.